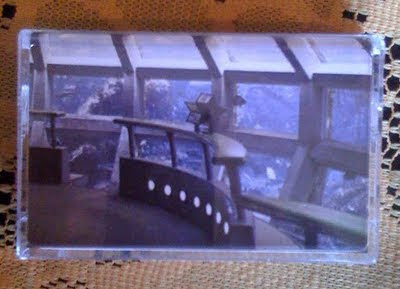 I just got a bunch of copies of my new solo tape Stereo Face, on Jason E Anderson's Seattle based Gift Tapes label. It's a 40 minute, 7 song voyage through our galaxy cluster told in warm analog modular synth tones and tape delay, lovingly recorded to 2 and 4 track cassette. Order it straight from me for $6 PPD. Who's that Drop of Water? To ramp up for Friday's big show at the Time-Based Art festival we did an interview with Eva Lake for KBOO's Art Focus. You can listen to it here. Live at Hawthorne Burgerville from Oregon Painting Society on Vimeo. The show is this Friday, Sept 11th at 10:30pm at The Works @ Washington High School (SE 13th and Stark). The cost is $10 and the band Health is also performing after us. We've been working hard on this show. Live music, video, dancing, speaking, recorded sound, sculpture, chanting. It's the culmination of everything we've been doing this year. Featuring choreography by Wooly Mammoth Comes to Dinner and a performance-within-the-performance by Dragging an Ox Through Water. Got a couple fall festival gigs this week. TODAY (Sunday) is Bumbershoot in Seattle for my last parenthetical girls show. We play at 3:30pm at the EMP sky church. Then Friday the 11th is Oregon Painting Society at the Time Based Art festival in Portland. We're performing at The Works at the former Washington High School.